(CNSNews.com) – As the regime in Tehran marks the 40th anniversary of the Islamic revolution, supreme leader Ayatollah Ali Khamenei wants Americans to know that “Death to America” doesn’t apply to everyone, just to leaders like President Trump, Secretary of State Mike Pompeo and National Security Advisor John Bolton. 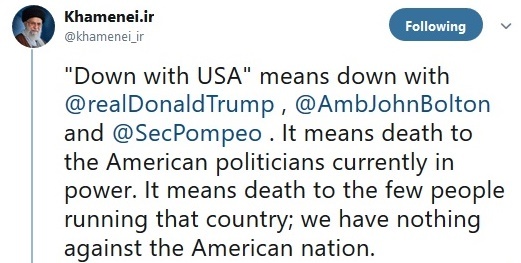 “ ‘Down with USA’ means down with @realDonaldTrump, @AmbJohnBolton and @SecPompeo,” the ailing 79-year-old said in a posting on his official Twitter account, khamenei.ir. February 11 (Bahman 22 in the Persian calendar) marks the anniversary of the 1979 revolution, which saw the Western-backed Shah ousted by fundamentalist supporters of the late Ayatollah Ruhollah Khomeini, Khamenei’s predecessor. Khamenei said Iran’s “enemies” have been hatching plots against the Iranian establishment for 40 years. In his speech to air force officers, Khamenei raised a familiar theme of how Trump’s withdrawal from the 2015 nuclear deal, the Joint Comprehensive Plan of Action (JCPOA), proved his belief all along that the U.S. is not “reliable” and cannot be trusted. Even those in the establishment who led the negotiations that led to the agreement now admit that to be true, he added. With debate now underway about various proposals by the Europeans as they try to keep the JCPOA alive, Khamenei said his advice is that they, too, should not be trusted. He concluded his remarks by thanking the Iranian people for their “heroic resistance … in the face of brutal enemies,” and to predict a bright future despite current economic difficulties – which the regime blames on U.S. sanctions restored after Trump withdrew from the JCPOA.